"But I did! I did see an elephant in my bird bath." "Sure, sure, I know. I keep a giraffe in mine." Every fall I look forward to the release of a new Looney Tunes - Golden Collection. Six years in, it's like the old faithful of DVD sets: four DVDs of cartoons, 15 cartoons each disc, a pile of extras. You can always count on there being some good stuff in the batch. After all, they are working with one of the most extensive libraries of animation from one of the most venerated studios in the field. There's no mistaking what you're going to get. Thus, it has been with great excitement that I have watched the Looney Tunes - Golden Collection, Volume Six, having been surprised to discover that not all boxed sets in the series are created equal, that some are going to outshine the rest in terms of selection. Get enough of the best and the brightest together, and whammo! These four themed DVDs are brilliant through and through, featuring the usual rounds of 15 per, but also with 20 bonus cartoons spread across the collection as supplemental features. That's 80 cartoons, friends, and not a clunker among them. This time, they didn't forget to bring the gravy! Though the disc (and the set) kicks off with a Bugs Bunny cartoon, "Hare Trigger," pitting the ol' gray rabbit against Yosemite Sam, this "All Star" themed collection of shorts is all about variety, and it quickly makes the jump from Warners' biggest star to give some airtime to many characters that people know and remember, they just don't always remember that they know and remember them until they see them. In fact, the disc is kind of arranged to move from the more famous characters to the more obscure. 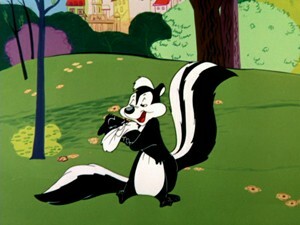 From Bugs to Daffy to Foghorn Leghorn, Pepe le Pew, and onward. Most of the characters get a couple of cartoons rather than just being a scattershot of various features, but this is not an exact science. The Pepe le Pew cartoon is one I was most excited about, and not just because I see my own love life in the little skunk's earnest failures. I've always had a soft spot for the Maurice Chevalier parody, even before I knew who Maurice Chevalier was. The selection here, "Heaven Scent," is a good one, with the lady cat painting the white stripe on herself in order to outmaneuver some angry dogs, and having it backfire on her, as it always does, when our odoriferous Lothario catches wind of her charms. A couple of other characters that surface here are Charlie Dog, a Chuck Jones-created mutt, who cons his way into different homes to get off the harsh streets where hunger and dog catchers are going to get him. In "Dog Gone South" it's the mansion of a blustery southern gentleman and in "Often an Orphan," he takes advantage of Porky Pig. A dog of another sort, a snooty thespian, struts through Robert McKimson's "A Ham in a Role," swearing off low-comedy before getting into a slapstick tussle with the Goofy Gophers, Mac and Tosh, the latter voiced by Stan Freberg. It's a deliciously funny cartoon, busting through pomposity the way the Looney Tunes were always so good at. Tweety, Road Runner, Elmer, the Three Bears, and even Satan himself all make an appearance on this disc, making for a really strong leader for this Golden Collection. Six volumes in, and some 360 cartoons later, and there's still gold down in those animation vaults to earn these boxed sets that title. This is a disc that many animation fans have been waiting for, as it includes a lot of the WWII cartoons (and even some with Bosko that are pre-WWII and hearkening back to WWI) that have been out of circulation for a while as their propaganda-tinged humor is not always politically correct. But, what can you expect from cartoons that often have Hitler as a comedic patsy? The Nazi leader matches his rather dim wits with Bugs ("Herr Meets Hare"), Daffy ("Daffy - The Commando"), and a bunch of Gremlins from the Kremlin ("Russian Rhapsody"). I can't imagine I'd ever have known as a kid that the Gremlins used a Joseph Stalin mask to scare the Fuhrer, but then, I grew up in the '80s, so I doubt anything with a remotely pro-Russian element would have ever made it on my local airwaves. A lot of the plots for these cartoons could be swapped with more regular Looney entries. For instance, switch out the Baby Huey-like German in "Herr Meets Hare" for Elmer Fudd, and you have a pretty normal cartoon about Bugs Bunny being hunted in the forest. Yet, there does feel like there is an added incisiveness to the humor in these wartime shorts, with the righteous anger brought on by war giving the animators an extra reason to put the boot in. I have always liked "The Ducktators" for this, a particularly savage skewering of the various avian Axis powers. Hawks must have loved the Dove of peace rolling up his sleeves and kicking some tail. As the Goose Mussolini (Goosalini?) says, "Tutti Frutti! Tutti Frutti and all kindsa whipped-a cream and wala-nuts!" "Rookie Revue" is like a travelogue of gags all focused around new Army trainees and "Meet John Doughboy" is a collection of jokes about overseas efforts, while Bob Clampett's "Wacky Blackout" and the more broad "Weakly Reporter" gives the homefront the same treatment. Thus, we have both an "over there" and "at home" approach, looking for humor in both aspects and pushing the "do your part" message. Other cartoons also step away from established characters, such as "The Draft Mare," which stars a horse trying to get into the army, and "Fifth Column Mouse," a cautionary tale about a rodent who gets swayed to go against his own kind by a cat with offensively Asian mannerisms. New characters also have familiar faces, as entertainment personalities are turned into dogs and lampooned for a good cause in "Hollywood Canine Canteen." 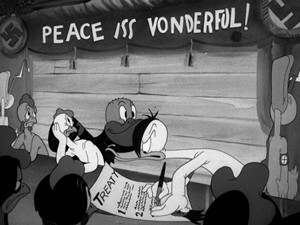 A title card before the final three cartoons informs us that they were funded by the Sloane Foundation, and amidst familiar plots featuring characters like Sylvester, Tweety, and Elmer, the Looney Tunes team works in information about the virtues of capitalism. In "By Word of Mouse," a foreign mouse visiting the U.S. listens to a lecture while avoiding Sylvester's hungry mouth, and in "Heir-Conditioned," that self-same Sylvester inherits a vast fortune. "Yankee Dood It" remolds the elves and the shoemaker story to espouse on worker's rights. I remember these cartoons from when I was a kid, and I always thought there was something weird about them. As an adult, I'm actually kind of impressed by the heapfuls of sugar that make this medicine go down. As educational propaganda goes, this stuff is pretty good. Overall, the whole disc speaks to cartoons as a popular form to investigate the zeitgeist of the nation, broaching many dangerous topics while still managing to keep it light. The third DVD in the set takes us back to the early days of Termite Terrace for a collection of shorts from the beginning of the 1930s. These black-and-white cartoons feature characters who didn't stick around once color came into the picture, and the style of animation is more crude and developmental. The first 10 cartoons here alternate between two characters, the strange animal/boy hybrid Bosko and Foxy the Fox. In a lot of ways, these two leading men are interchangeable, as they don't have much by way of personalities beyond being cartoon creatures that sing, dance, and get into mischief. Which isn't to say that these shorts aren't entertaining, quite the contrary, it's just that they inhabit a different space than the more enduring Looney Tunes canon. As with much early animation, most of these shorts are less about choreographed gags or even plot, and more about music and movement. Often set to the rhythm of a popular song, such as "Shuffle Off to Buffalo" or "Smile, Darn Ya, Smile!" 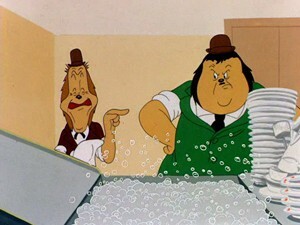 (popularized again in Who Framed Roger Rabbit? ), the general formula is that these characters walk into an environment or situation, tumble into a few gags based on that environment or situation, and then sing and dance. Thus, Bosko goes into the jungle in "Congo Jazz" and ends up running from wild animals before eventually joining in a musical number with them. Many of these cartoons also reflect the time period, with nods to the Depression. For instance, in "Smile," Foxy is a streetcar conductor, and we see a gaggle of scruffy tramps along the tracks. Likewise, songs like "We're in the Money" give the animators the opportunity to take some air out of the audience's problems. That song is the title of a 'toon about after-hour activities in a department store and also a sing-along in "Bosko's Picture Show," where the character plays an organist at a movie theatre. The latter also contains some of the many pop culture references in this spate of cartoons, featuring caricatures of Laurel & Hardy, Jimmy Durante, and the Marx Brothers. Some are less recognizable, such as Eddie Cantor in "Shuffle Off to Buffalo." For as innocent as these old black-and-whites may appear, don't mistake them for such. Beyond the often regrettable racial stereotypes, they also have a rather ribald air that marks them as clearly intended for adults. "The Booze Hangs High" shows Bosko and some farm animals getting loaded on hooch, and Foxy pours liquor into his car like it's rocket fuel in "You Don't Know What You're Doin'!" Even the squeaky clean boy Buddy, who stars in three of the last cartoons in the set (and, to my mind, the weaker ones), runs a bar in "Buddy's Beer Garden." And, yes, in "Bosko's Picture Show," Bosko calls Dirty Dalton a "dirty f**k," your ears aren't deceiving you. DVD 3 ends with "A Cartoonist's Nightmare," a short where a late-working animator is sucked into his own cartoon and subjected to a variety of tortures as comeuppance for the paces he's put his characters through in his film. Ultimately, he is rescued by his own fictional hero, Beans the Cat. It's a fun idea, and Warners would return to this fourth-wall breaking formula of having animators interact with their characters time and again (even on this set, we get the bonus "Rabbit Rampage" short on DVD 1, where Elmer Fudd is the unseen wielder of Bugs Bunny's paint brush). From the get-go, there was this sense that animation not only could do anything, but should, a sentiment that is regularly put to use in this here gathering of nimble and elastic characters. Hell, even Bosko began as a boy filled with ink. Talk about saving the best for last! The Warner Bros. animation factory never lost sight of the need to stretch themselves creatively, and so they set up special slots in the production schedule where after a certain amount of the expected shorts, the teams could experiment with new ideas and one-off projects that weren't tied to the iconic characters. This yielded wonderful and surprising results, including many cartoons that became iconic in their own right. The programming begins with the Dr. Seuss adaptation "Horton Hatches the Egg," a pleasing mash-up of the Seuss and Looney Tunes styles. You get the poetry and the story of the original, but with extra gags that were positively Warners. Peter Lorre as a suicidal fish, anyone? From there, it's anything goes, with gag anthologies like "Lights Fantastic" (jokes using neon signs along Broadway) and the perils of the modern housewife in "Wild Wife" (the Little Mrs. sure gets hers!). 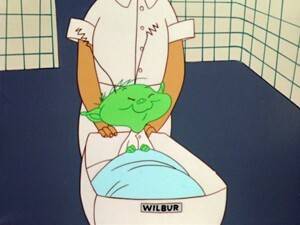 No concept was too absurd, and so we get the Chuck Jones cartoon "Rocket-Bye Baby" about an alien boy being born into a human family and the similar Friz Freleng tale, "Goo Goo Goliath," where a drunken stork delivers a giant's child to a regular-sized couple. Or there is "The Oily American," the tale of the Native American who rebuilds the plains inside a mansion after striking it rich on the oilfields. The animators could also experiment with style, changing up the usual approach. I love "Page Miss Glory," which uses art deco designs created by artist Leadora Congden in following a dreaming country bellhop through a musical work day at a big city hotel. Chuck Jones and Maurice Noble adopt a more abstract illustrative style for their tribute to noise, "Now Hear This," and Noble's singular design style also makes "Martian Through Georgia" stand out as one of the more visually striking cartoons in the collection. Of much interest to the animators, apparently, is the relationship between dogs and cats. There is the self-serving hound who steps all over his cohabitant feline in "Fresh Airedale," or the bullying dog who puts a cat through its paces in "Chow Hound." 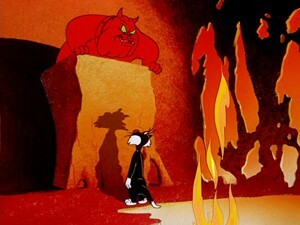 I remember this one being one of my favorites as a kid because of the final, wicked scene where the cat gets its revenge. More sadistic, though, are the almost Rube Goldbergian punishments the bulldog puts the cat through in "It's Hummer Time." The cat keeps trying to catch a humming bird, and the smart bird keeps tricking the cat into disturbing the sleeping canine. The last disc finishes with a cartoon I've never seen before, "Norman Normal" from 1968. This rare piece of animation is a total oddity in the Warners canon, directed by Dave Dixon and N. Paul Stookie (of Peter, Paul, and Mary) rather than the usual names we expect to see in the credits. It begins with a British invasion-style band playing the main character's theme song, and then the cartoon itself is an examination of the inner-workings of the neurotic brain of Norman. The animation style is a bit more simplistic than the classic Looney Tunes period, but is entirely befitting of the late '60s pop-art aesthetic. The two directors also do all the voices, making "Norman Normal" stand out even further. What a treat! All of the cartoons on Looney Tunes - Golden Collection, Volume Six are in full frame in keeping with their original aspect ratio. This is one of the better looking volumes in the series, with the cartoons all having a clear picture and strong, vibrant colors. There are the occasional instances of dirt and scratches, some of which look like they are in the original cel paintings, and none of which are so terrible that anyone should be mad. Some of these cartoons are nearly 80 years old, and given that, they look pretty stupendous. They certainly look better than I've ever seen them in my lifetime. The cartoons are mixed in mono, but the sound quality is very good, without any hiss or pops or distortion. Unfortunately, the studio is sticking to its decision to have no alternative language options, which were available on some of the earlier sets. All we get are optional English subtitles for the deaf and hearing impaired. 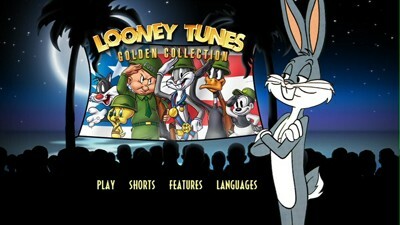 Each DVD on Looney Tunes - Golden Collection, Volume Six has its own unique extras. 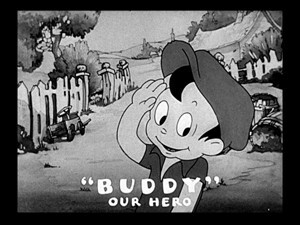 Many of the cartoons have alternate audio tracks, including tracks where the music and the effects work is isolated and audio commentaries by contemporary animators and historians. You can see which cartoons have what extra tracks by looking at the lists above. I have indicated which titles and what your choices are. All of the commentators are ones we know from previous sets, so no surprises, very little new to report. If memory serves there are less of them this time around, though, and definitely less of a critics pool being drawn from, but that's about the only difference. All are usually informative, with the historians and critics being particularly good at sharing information about the production of each short. The Greg Ford tracks have audio from old interviews he conducted with the some of the original creative staff. 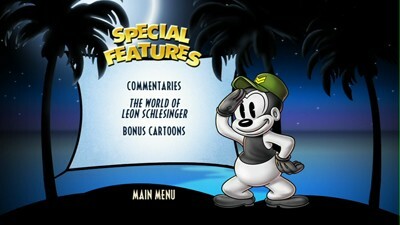 On all the DVDs, the cartoons can either be chosen one by one, or you can use the "play all" option to watch all the titles straight through. In order to access commentaries, you do have to go to the commentary menu, however; you can't just toggle into them with your audio button when watching each short. The DVD 1 supplements lead with two television specials, "Bugs Bunny in King Arthur's Court" and "Daffy Duck's Easter Egg-Citement." These were created in the late 1970s, with the Bugs special directed by Chuck Jones and the Daffy by Friz Freleng. They were made to fill a half-hour time slot, making them about 24 minutes without the commercials. They aren't as good as the Warner Bros. heyday, with some of the material being just recycling of gags and concepts. Still, for old farts like me that remember watching them way back when, there is some nostalgia to be had here. The first disc is rounded out with a couple of trailers for other animation DVDs. DVD 2 has a bumper crop of extra shorts as a supplement, with the main collection being five cartoons directed by Friz Freleng during a period working for MGM: "The Captain's Christmas," "A Day at the Beach," "Mama's New Hat," "Poultry Pirates," and "Seal Skinners." Friz went to MGM in 1937, and all of these cartoons are from the "Captain and the Kids" series he worked on. 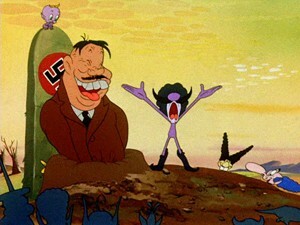 This series was based on a comic strip that featured the same characters as "The Katzenjammer Kids" and was created by Katzenjammer cartoonist Rudolph Dicks after he left the Hearst newspaper empire. 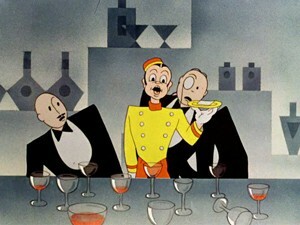 These are solid comedy shorts and are another reminder that we need comprehensive sets of MGM cartoons tout de suite. The second disc is finished off with three more Warner cartoons: "The Fighting 69 1/2th," the chronicle of two insect armies in a civil war over a picnic; "Hop and Go," a black-and-white selection with Claude Hopper, a kangaroo; and "Confusions of a Nutzy Spy," another black-and-white picture with Porky and his bloodhound chasing after Missing Lynx, a foreign agent. Be warned of a weird audio glitch early in "Hop and Go" where the music suddenly moves to the front of the mix and the dialogue to the back, and they keep swapping places all throughout. That cartoon also fits the war theme of DVD 2 because Claude ends up in a battle zone at the end. DVD 3 has a rather cool section of films (running nearly half an hour) made by Leon Schlesinger's live action department. 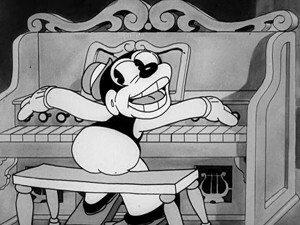 After a brief explanation by Jerry Beck and a member of Schlesinger's staff, Martha Sigall, we get three examples of the kind of things the Studio did: "Crying for the Carolines," a musical number with rather artsy graphics created to replace the live organ performances before movies; the short animated credits for the John Wayne B-movie Haunted Gold; and the 18-minute "Schlesinger Productions Christmas Party." 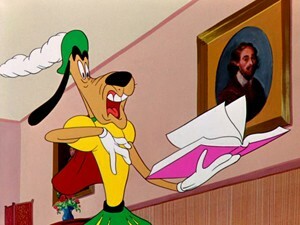 The latter is a gag reel full of skits and shtick, narrated by Mel Blanc, and featuring staffers at the studio acting as cut-ups, including famous animators like Tex Avery and Robert Clampett. It's fun stuff. Bonus cartoons on Disc 3 are as follows: "I Love a Parade," a musical cartoon based on the title song but set in a circus, for some reason; "I Love Mountain Music," a somewhat Western-themed short where magazine covers come to life; "Sittin' on a Backyard Fence," in which alley cats and other nocturnal urban dwellers host a revue; and "How Do I Know It's Sunday," wherein various products in a store take advantage of the lack of business on a Sunday morning. All four of these are black-and-white, in keeping with the main features on the disc. The last one looks a bit faded, but not horribly so. DVD 4 is the one disc to have a documentary, this one on Mel Blanc and called "The Man of a Thousand Voices." The new program runs 1 hour and 10 minutes, and it features commentators like Hank Azaria, Gary Owens, Stan Freberg, and others discussing the life and work of the man who lent his talents to so many wonderful characters. The documentary is illustrated with cartoon clips and vintage photos and footage of Blanc. 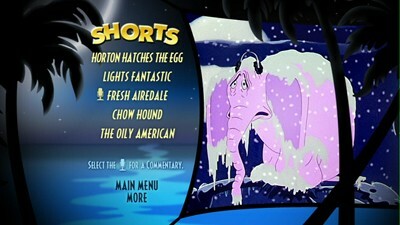 In keeping with the one-off theme of the disc, the bonus cartoons are also of the more creative and unique variety: "Sleepy Time Possum," gives us a southern possum family where the father dresses up as a dog to try to scare his son out of being lazy; "Punch Trunk," the Chuck Jones-directed story of an elephant five-inches tall; "Wild Wild World" works off of the concept that a lost documentary filmed during and all about the dinosaur age has been discovered and is being shown for the first time; and "Bartholomew Versus the Wheel" is the story of a dog whose hatred of wheels takes him on a grand journey. The latter is narrated by a little boy (the dog's owner) and is animated in a storybook art style. Both "Punch Trunk" and "Wild Wild World" also feature alternate music-only tracks. The four discs are held in a foldable cardboard case with plastic double-disc trays. This then slides into an embossed slipcase. The design is really nice on this one, with a war-time theme in the new illustrations, including parodies of propaganda posters on the interior. Each disc also gets its own side on the foldable book, with lists of the main cartoons and bonus features. Wow, wow, wow! I loved the Looney Tunes - Golden Collection, Volume Six boxed set. This always great series could have become too familiar, could have become the kind of thing fans start to take for granted, and the studio could be cranking them out by now without really trying, but then out comes one of the best collections yet. With two discs following specific themes--wartime shorts and early black-and-white material--and two taking a more broad approach to what is gathered together, we get a grand variety that offers us the very best from the Looney Tunes vaults. Plus, with this year's extras being mostly more cartoons, the sheer tonnage of animation in the box is enough to earn Looney Tunes - Golden Collection, Volume Six a place in the DVD Talk Collector Series.